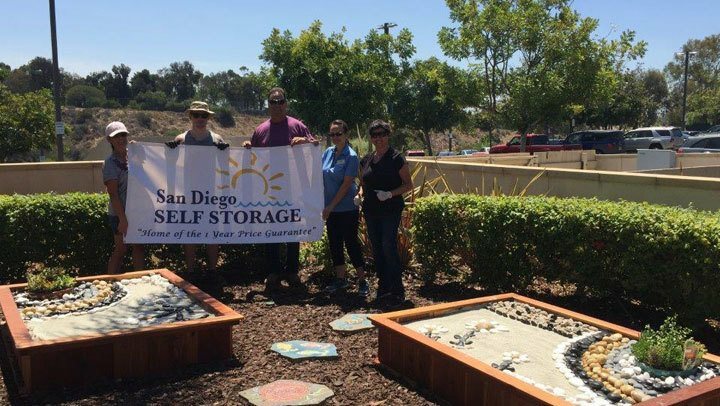 San Diego, CA, August 4, 2016 - In 2015, San Diego Self Storage (SDSS) began a Community Giving Project where all 17 of our locations were given $500 that the teams at each site donated to a local charity of their choice. San Diego Self Storage also contributes to other organizations which benefit and serve the San Diego community at large. The Fisher House Foundation is best known for a network of comfort homes where military and veterans’ families can stay at no cost while a loved one is receiving treatment. SDSS worked with the Fisher House team to assess their needs, and during initial visits to the project site, decided that an enhancement of their back patio would be a worthwhile donation. A simple plan that was maintenance free, and which used drought tolerant plants was approved. SDSS worked on the project July 19th - 21st, and teams of 4-5 San Diego Self Storage employees took turns dedicating their time and passion to the project. Mulch was placed on the ground and two redwood, raised planter boxes were installed. Each planter box was filled with sand, decorative rocks and a few succulent plants. The idea evolved into a kind of Zen garden where adults and children can place the rocks on the white sand and rake the sand to form interesting designs. “We are very proud of the project, and hope that it brings great joy to those who seek its comfort. We look forward to our next project with Fisher House in the very near future,” said SDSS Managing Partner, J. Terry Aston.